Yorkshire Terriers are one of the most popular of all small dog breeds. They’re tiny dogs with a bold, feisty personality. However, Yorkies do have some special dietary needs. Here are some things to consider when choosing the best dog food for a Yorkie. Because Yorkies are so small (generally weighing 4 to 7 pounds as adults), they have a small stomach to match their size. This means they cannot eat large meals. You will need to feed your Yorkie several small meals per day. Yorkies can also be especially prone to hypoglycemia or low blood sugar so feeding your Yorkshire Terrier several small meals per day will help avoid this problem. This is especially true with young puppies. 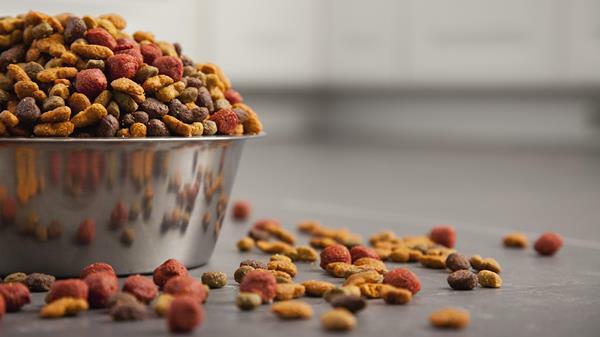 If you are feeding your Yorkie a kibble dog food, make sure you choose a food with small, bite-size pieces of kibble. This makes it easier for your Toy dog to eat and digest the food. 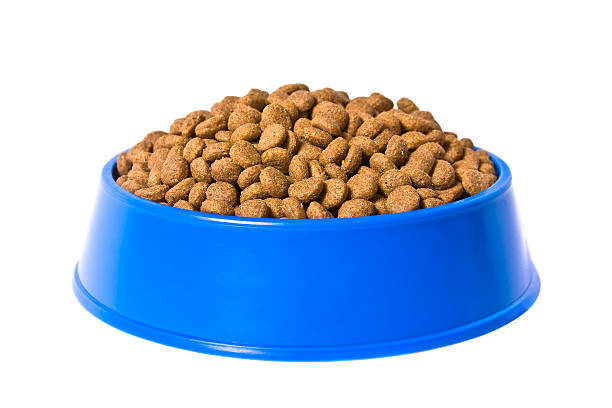 Toy and small breed dogs often need dog food that is more calorie-dense than food for larger dogs. Pound for pound, small dogs use more energy and burn more calories than bigger dogs. 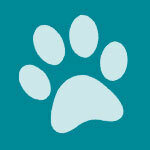 Many dog foods designed for small and Toy dogs are packed with more calories than food for larger dogs. 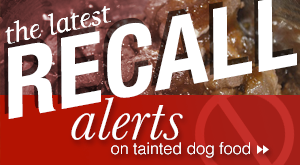 Look for foods that are especially formulated for Toy and small dogs so they have all the calories your Yorkie needs. These foods often have too many calories for big dogs who can become overweight if they eat them. There is some slight evidence suggesting that kibble is better for a dog’s teeth than canned foods but the difference is so slight that this probably shouldn’t be the deciding factor in what you feed your Yorkie. There are many ways to keep your dog’s teeth clean and healthy. 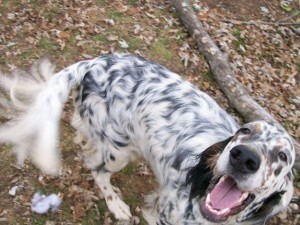 You can give him tartar control biscuits, safe chew toys, and dental toys for dogs. Since Yorkies can be particularly prone to dental disease, you should brush their teeth regularly with a toothbrush and toothpaste made for dogs. From a price viewpoint, canned food is more expensive but if you are feeding one small dog, it can be cost effective to purchase canned food as you need it instead of large bags of kibble. However, it’s usually easier to store and carry bags of kibble. Many times the choice comes down to what your dog prefers to eat. 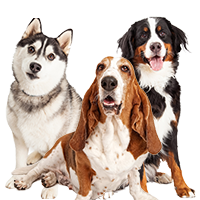 Grain free foods are popular right now and many people like the idea of feeding a dog food that is closer to what a dog would eat in the wild. However, you should be aware that “grain free” doesn’t mean carbohydrate-free. 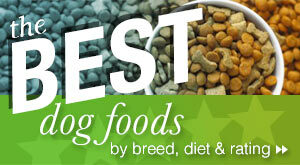 Dog foods are typically made up of protein, fat, and some kind of carbohydrates, even if they don’t use grains. Some of these carbs are not necessarily better for your dog than some grains, so it’s important to read the labels. As long as your Yorkie doesn’t have food allergies, he should be able to eat foods with or without grains. 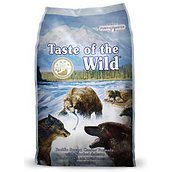 We love recommending Taste of The Wild recipes to dog owners. Overall, it’s a well-respected business that serves high-quality dog food. Pacific Stream Dry Puppy Food is packed with the nutrients your Yorkie puppy needs to grow and develop, like omega fatty acids for skin and coat, as well as probiotics to promote healthy digestion. 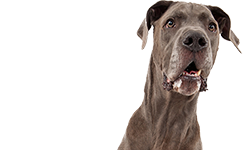 Blue Buffalo as a brand focuses on providing your pup with adequate nutrition – not the fillers and artificial ingredients you find in lots of commericia dog foods. 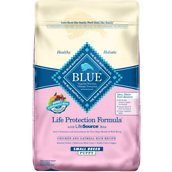 This Blue Buffalo formula is great for a Yorkie, in particular. Small dogs burn a lot of calories, so they need a puppy food that is nutrient-dense like this one, as well as a food with smaller kibble. Even the pickiest canines typically enjoy Fromm. It’s full of safe, healthy, and tasty ingredients that your Yorkie will love. 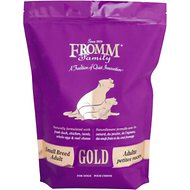 This Fromm formula includes everything your pup needs to grow into a healthy adult – taurine for heart and eye health, alfalfa for bone strength, and probiotics for digestive health. Merrick is an affordable, healthy brand that’s made in the USA. This recipe is grain-free and provides the nourishment your Yorkie needs. With freeze-dried chicken, sweet potatoes, and tons of other fruits and veggies, we’re confident your pup will love this recipe. Looks familiar? This Pacific Stream recipe is the “adult version” of the puppy food we’ve recommended for your Yorkie. With similar ingredients, it’s a great way to seamlessly transition your dog from puppy food to an adult recipe without shocking their system. Orijen is consistenly an industry leader when it comes to providing safe, healthy, and delicious food for your pup. 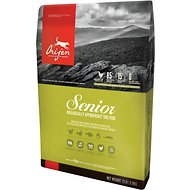 We love Orijen senior as a maintenence food for older dogs who are still fairly active and healthy. 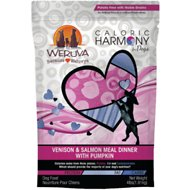 If your aging pup needs an alternative meat protein, Weruva’s Caloric Harmony hits it out of the park. Made with grass-fed venison, you can be sure you’re offering your Yorkie the nutrition he or she needs. Just like any dog breed, Yorkies can have health problems like hypoglycemia (low blood sugar swings), skin allergies, retinal dysplasia, and liver issues. 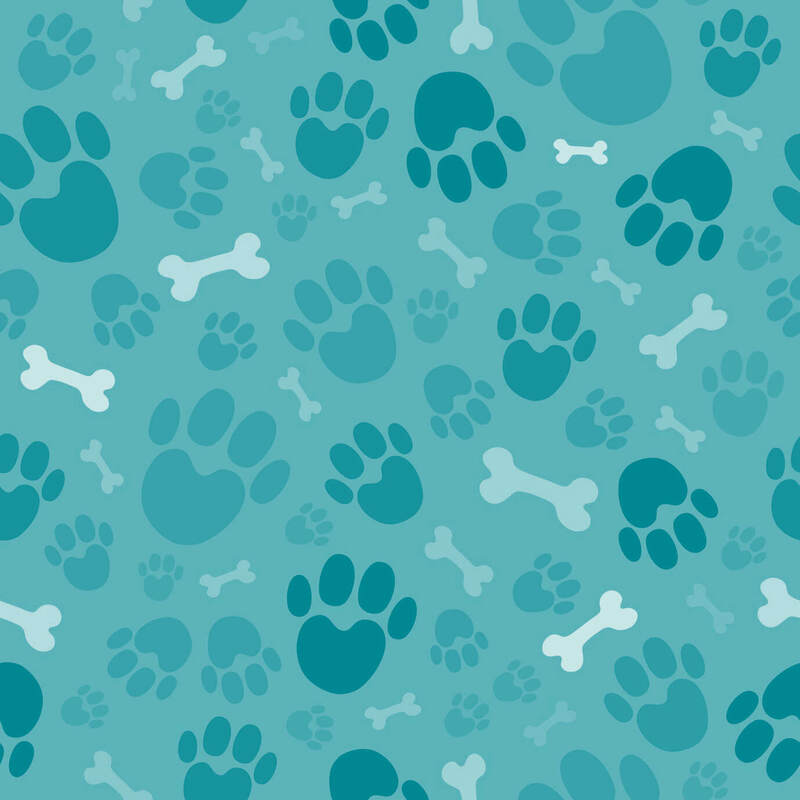 If your pup starts to show signs or symptoms of sickness, consult your veterinarian. 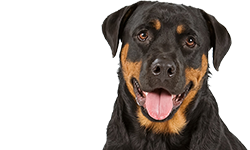 A vet will also be able to point you in the right direction when it comes to what kind of special dietary needs your dog might have. 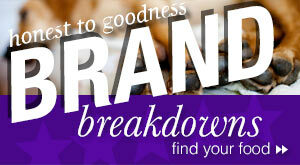 Looking for more dog food recommendations for your Yorkie? 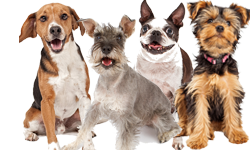 Wellness also has complete lines of dog food formulated for Toy and small breeds called Complete Health Toy Breed and Complete Health Small Breed. 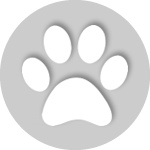 Other brands which we can recommend include Victor, Acana, and, for people interested in organic dog food, Castor & Pollux and Newman’s Own. i have a yorkie/chihuahua – and the past 4 yrs i have checked various websites, gotten so many opinions from vets, pet store owners and of course people on the internet. i have come to a conclusion, which is, i don’t think that anybody really knows what a dog should really be eating. I just have to mention what dog food brand i’m feeding and i get a whole list of reasons why i shouldn’t be feeding it. Well it has corn, wheat, by-products etc, and they’re not good for dogs. Who says they’re not good? or this brand isn’t good because it doesn’t have enough meat in it. Who’s eating it the owner or the dog?, or it’s not holistic. My dog doesn’t know what holistic means. The topic of dog food is right up there with politics and religion. I had the same problem w my yorkie, his name is Jasper and I tried a product from pet goods called Stella and chewy comes in a red bag. They have bout 5 flavors, his favorite is duck its a freeze dried patty. Its 95 pct. Bones and organs w vegs and friuts all healthy for your dog. He is very healthy and his coat is full and shiney people stop me all the time and ask what do I feed him. Try it it will solve all your problems. Yes he can have cheese but sliced thin, not a cheese sauce. Good luck! My Yorkie loves stella and chew also, it has been a blessing since he was a food snob before. when he was a puppy they said he may have a small liver shunt, after finding and him loving stella and chew all problems gone and no more pills just went to the vet and they said they must have made a mistake he is doing so well! I have a yorshire terrier 6 months old we got him when he was 5 months having a hard time training him, does not want to eat is puppy food tried so far 3 kinds refuse them all,i tried boiled ckicken breast he loves it …bt he’s never full always wants more !!!! please need some help ….. I have a female 8 year old Yorkshire terrier. Food is her favorite thing ever. I poach organic chicken breast, give her organic baby carrots, raw, and a small amount of dry dog food. She does get small amounts of people food and treats of course. I found training her when she was a puppy was best done with treats and control, she would love to be the boss and I have to keep her in check. How long have you had her on this diet for? My yorkie is turning 10 soon and have been feeding him organic chicken, carrots, and brown rice all mixed together for about a year now; used to feed him dry food and one day he decided he didn’t like it anymore, I believe this diet is better for him overall but don’t know if he is getting what he needs, from a nutritional standpoint. What do you think? I have a year old male yorkie that I feed Alpo Prime Cuts which is what he was eating before I got him and he likes it now my coworker has 2 yorkies,she used to breed but don’t anymore, she says I shouldn’t feed him that but feed him science diet which I know about already cause I use 2 feed my full blooded chow years ago,should I change brands or not. I have 2 yorkie, they are 5 years old. One eat very well but his brother not, so I decided to give only dry food, science diet toy breed small bites has been so good for them. They’re healthy, playful most of the time, perfect health. I recommend Science Diet small and toy breed. I have a Yorkie who from a pup never like dog food. I’ve tried many brands. But what I learned to do was sprinkler a treat in with his food. I now use Stewarts freeze dried liver treats. They are healthy and he goes nuts for it. They are easy to crumble and they adhere to his food very well. A little sprinkler goes a long way. The dog food i use is Royal Canine but i give them organic steak, they smell it and walk away. I rescued/adopted a Yorkie a week ago. He would not eat what I bought (a natural grain free product) Natural Balance. A pet store gave me some samples of some natural products, no colors, etc. He enjoyed the Acana very much. The sample was the grassland. I am ready to buy him a large bag now and return the one I originally bought from another chain pet store. I am a new Yorkie mommy. I am concerned about Parco and worms. I have heard such horror stories. He 1st vet visit after I got him went great. Just looking for advice. My Yorkie Miah is almost 3 months old, but since day one that i got her, she does not want to eat her Yorkie puppy food, tried different ones. she however eats my older two dogs dried food! she pics up weight and is very healthy according to the vet? I have 3 yorkies, two 5 years old weigh 6.5lbs and one 3 year old weighs 5.5lbs. None of them are fussy eaters and will eat anything I put down to them. I have always fed them on royal canin Yorkshire terrier. My issue is the kibble is so small two of them practically inhaled it without chewing. I think if the kibble was bigger they might chew and crunch it,so I was wondering if using another larger kibble would be ok. They only get 12 to 15 grams twice a day. They all have long coats. Hi..!! I have a yockshire dog and her name is PINKY….she is 3 month old!! !she love eat a food one day only…and the next day she hate it…what i should do??? 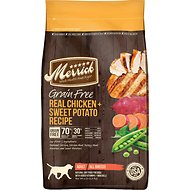 Is it ok to mix dry and wet food for all three meals for my 8 month morkie? I read your article on Best foods for Yorkies. My Yorkie is a male 4.2 lbs. who is a lousy eater and has been since I got him from a reliable breeder. When I picked him up he was only one pound and she called Pet Supplies Plus to have me pick up Purina Puppy Chow which he had been eating. She did say he picked out the red and green pieces which I found to be the soft pieces. He didn’t eat much at all. One day I was at Pet Supplies Plus and saw Royal Canine for puppies and was impressed with the tiny size of the pieces. He loved it right away and ate it for a while then now turns it away too. He gained a pound in a week while we were going to the vet for his shots weekly. the vet was impressed and I showed her the new food. Now I mean he turns down even people food except chicken. STEAK from the finest restaurants he turns down even cut in tiny pieces?? Do you have a suggestion on what to try?? Wet foods no go. Soft foods in bags no go!! Cesar Milan was ok for a while then now a no go?? I will boil chicken for him but even that doesn’t always work as the vet suggested to get him interested in food. I read Yorkies would .rather play than eat!! That is Zeus. I refuse to play toys with him much when he isn’t eating that day to avoid low blood sugars. He used to lap up Karo syrup and now have to fight to get that in him when I feel he needs some?? I love him to death but feeding him is my biggest nightmare!! Do you have any suggestions for a food for such a picky Yorkie??? He had a seizure once and needed to be hospitalized and they diagnosed liver shunt? His breeder said no way and since then I have seen her vet who agreed and two other vets who also agreed. Most felt he had a blood sugar drop to cause the seizure. I am desperate to find a food for him?? Thanks!! I think the best thing that you can do when it comes to finding what is best for your Yorkie is ask the breeders. Since these people spend their lives making sure their dogs stay healthy, they will be able to give you good advice on how to keep your dog healthy. Contacting a Yorkie breeder will be a great resource, and you might even walk away with a puppy. what about food for yorkies with liver shunt issues where they can’t have too much protein? For my yorkie (or actually more of a morkie) with liver shunt issues (that we fixed with surgery), we’ve been having trouble finding a good low protein diet to try out. we’ve settled on feeding her Lotus for now but wanted to see what other options there were. For my yorkie, I feed him only Lily’s Kitchen, organic food and they are easy to digest, good for sensitive dogs. With lily’s kitchen, my picky eater yorkie totally changed. In the past he wouldn’t really eat kibbles without wet food. Now he would finish all the dry kibbles without any addition. I have a 6 year old rescue Yorkie, don’t know what his background was, but he is so fussy on eating, one day he will like something you give him, the next he won’t, I have tried fresh cooked chicken, cooked beef, also royal canin kibble for yorkie and wet royal canin, he turned his nose up at them, tried him with various tinned food and kibbles but won’t eat them, he doesn’t seem to mind sausages but I don’t think he is getting his nutrients. He was underweight when I got him just over 2 weeks ago, and he has gained 0.2kg in 2 weeks. need some help and advice. I have a yorkie 6 years old. From the time h was a pup I have been feeding him Royal Canine. I couldn’t get it anymore as the pet store closed and no one else in my area sold Royal Canine. Every pet store owner told me that Royal Canine was middle in quality. So I read the ingredients and they don’t even use real chicken but chicken fat. I have tried several other brands. he gets a watery stool and can’t hold his bowl movement. He apparently can’t digest whatever has been suggested. e can handle Royal Canine o.k. though.. I am thinking tht if he will at least eat it to keep using even if have to go out of my way to get it. I tried Royal Canine for Yorkies and he hated it. He is a solid 10 pound a big yorkie. I give my Yorker ole Roy for a large breed as I have a large mixed breed also. The kibble is about 1/2 to 3/4 inch which makes my Yorker chew and his teeth are very clean. He is almost 8 lbs now and doing well on ole Roy for 4 years now. Lots of energy too. After much research, I found out that kibble is a very poor diet source for both dogs and cats. Even though they may drink a lot of water, apparently it still causes too much strain on the kidneys and they can’t keep up. 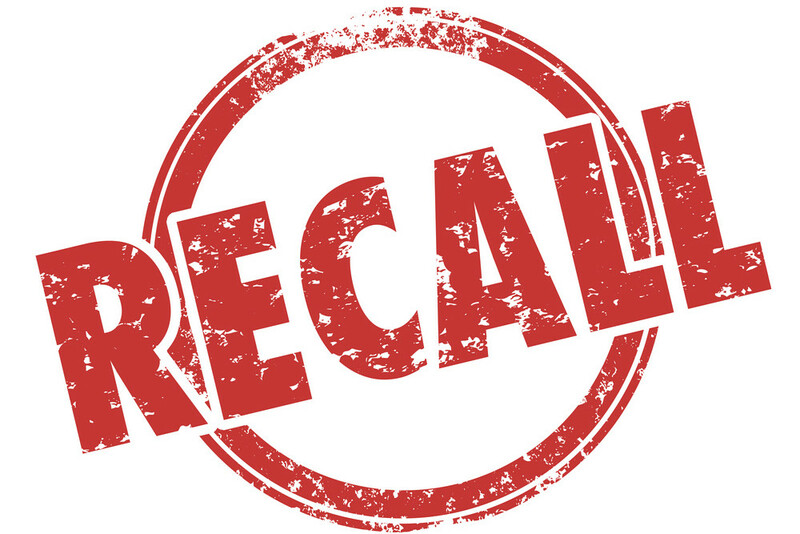 It seems kibble was developed around WW 2 as a temporary food source but the convenience and good marketing kept it as a staple, albeit a poor one, meaning the best kibble is still a bad one. The notion that kibble cleans their teeth is apparently false as well, although a site I was on promoted it for that very reason, having a vested interest in promoting this as fact. This was unbiased information that I sourced on the kibble. I have a yorkie male about 13lbs. He seems to eat ok most of the time but, he seems to be getting blockages in his digestive track which causes him not to eat. He gets dehydrated and then I have to take him to the vet. They follow his blockage with xrays and he passes it. I do not know what he is getting into that causes this to happen. This has happened twice in 6 weeks. The vet also told me he has a bladder stone and needs to be on special food. I do not mind all this but I can’t afford all the vet bills as well as everything else. Does anyone have any suggestions?? I am a afraid to give him chew toys etc. Please I love the little guy but he is sick again today. I have spent $1500.00 last month not counting the new food which is $50 a month. Please help!! !